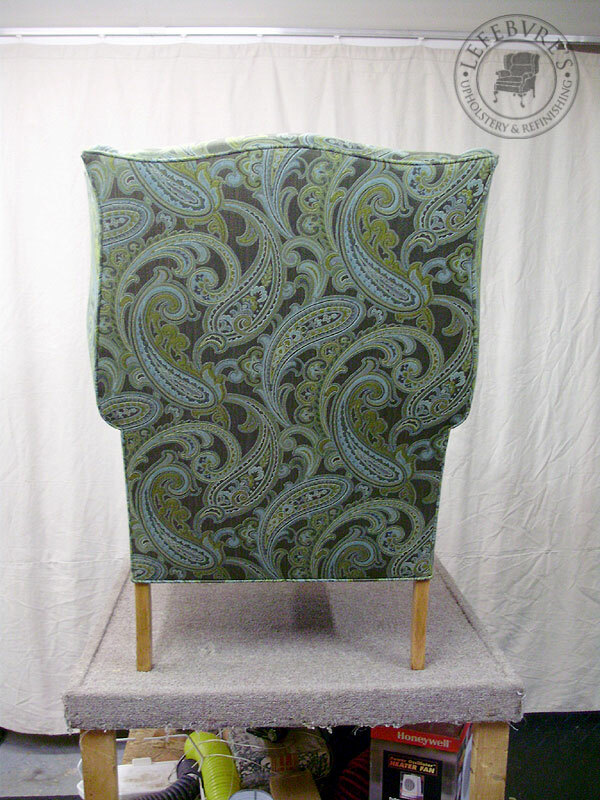 Here is the final piece in this set. 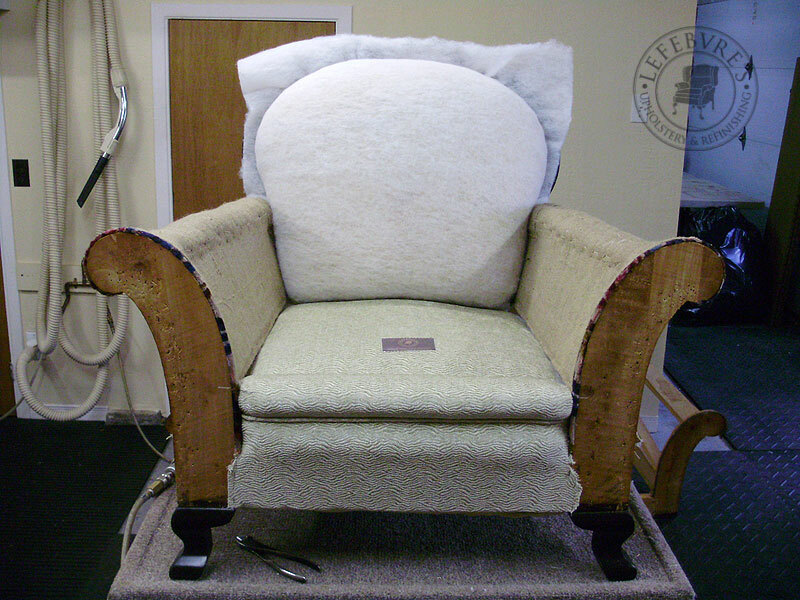 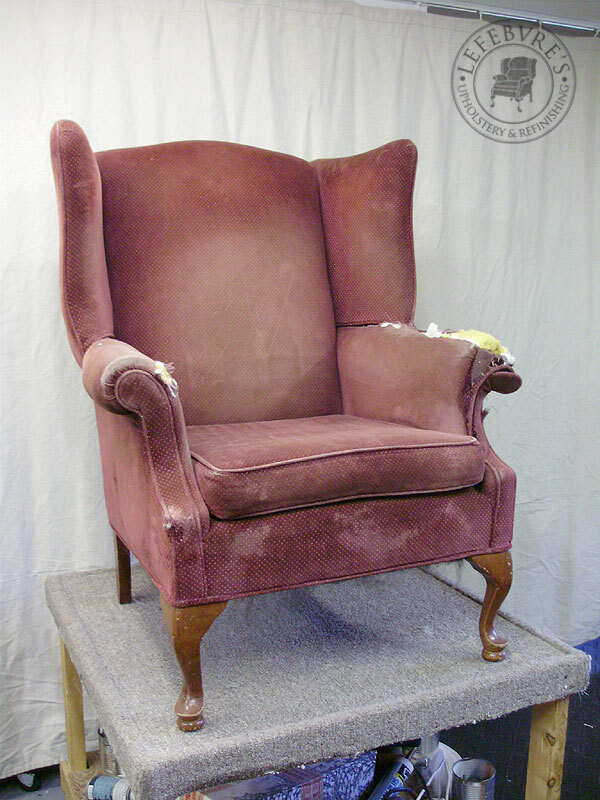 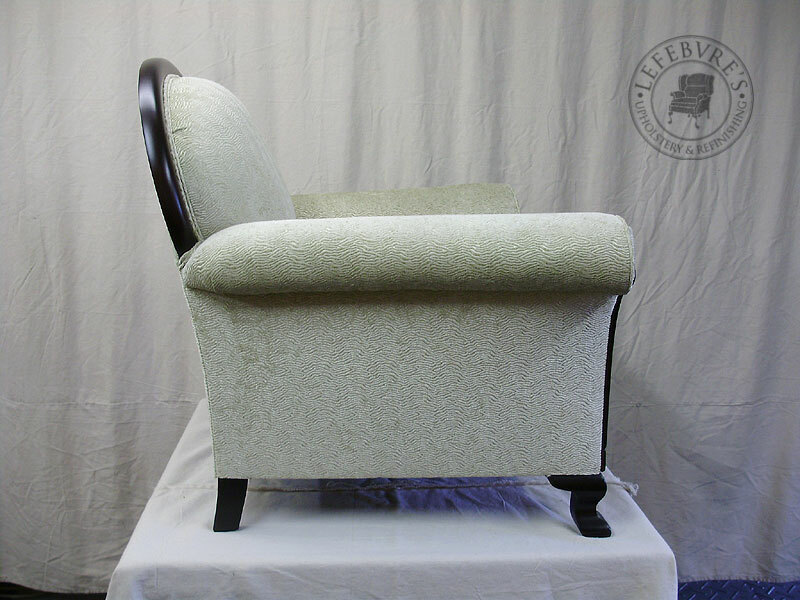 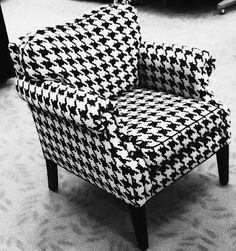 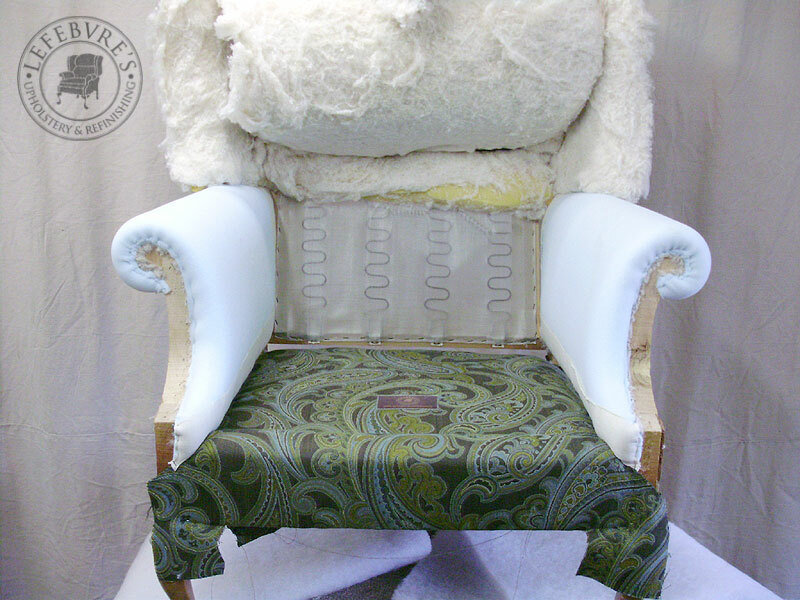 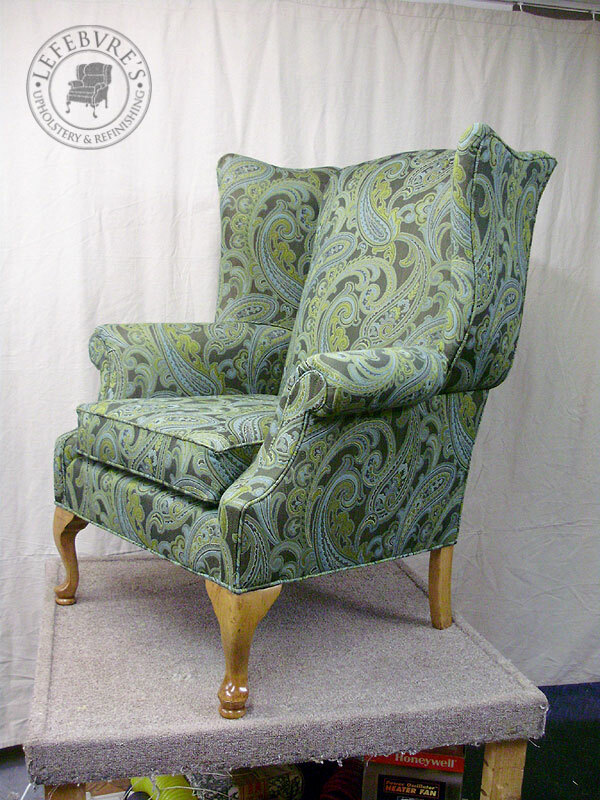 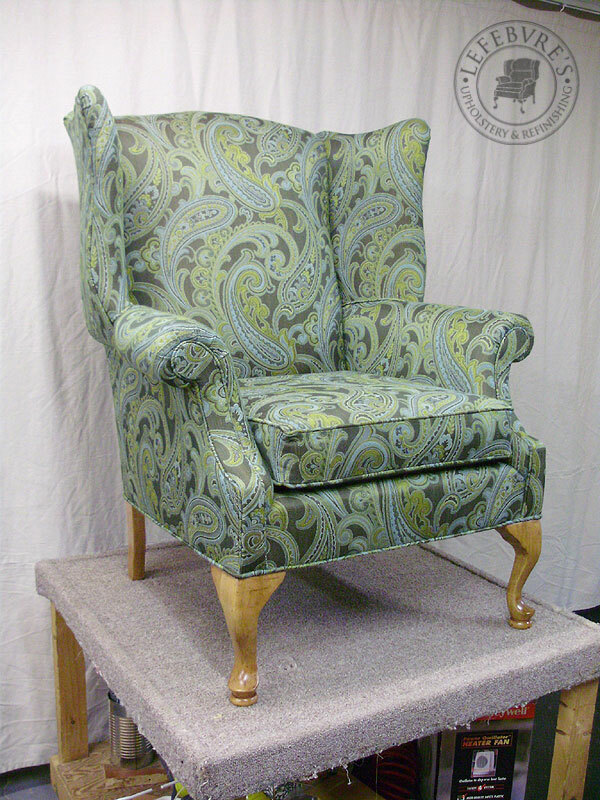 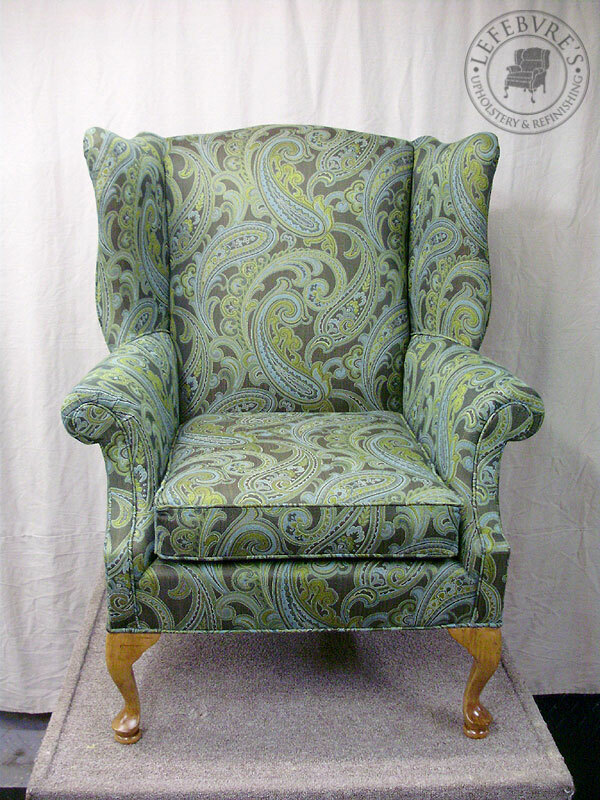 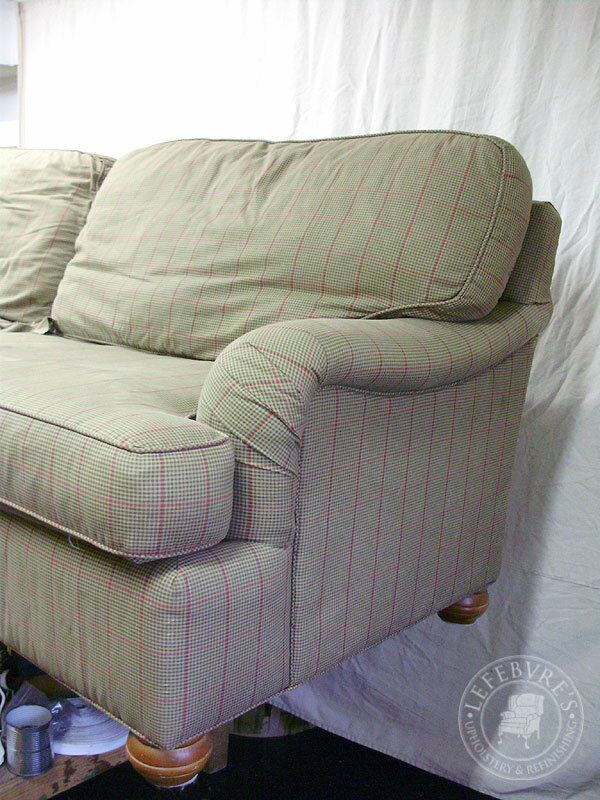 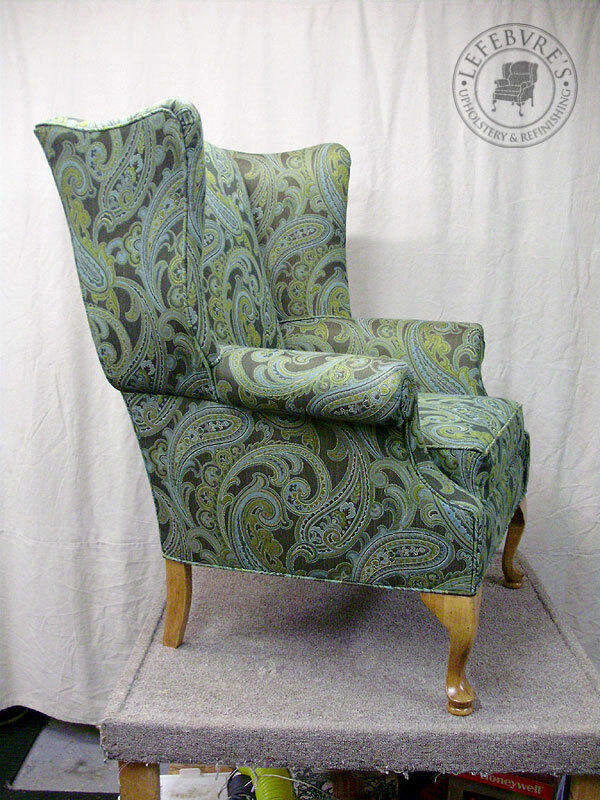 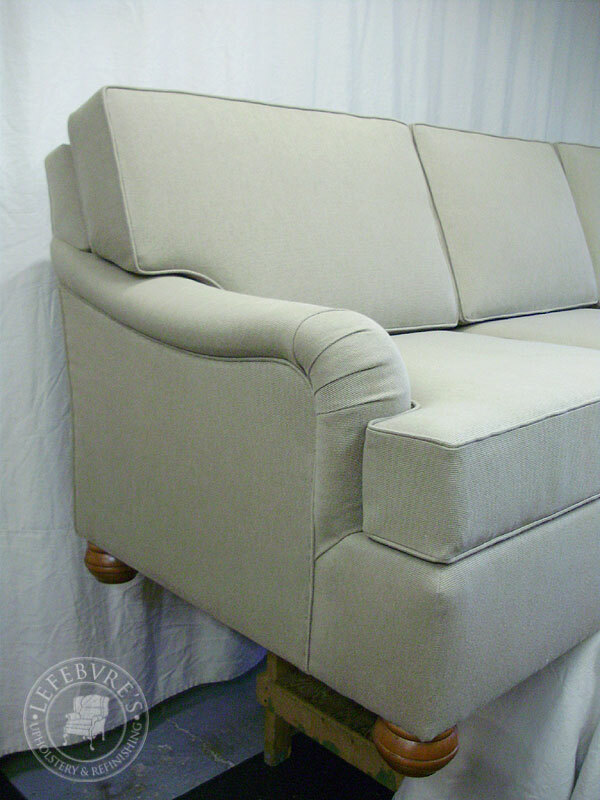 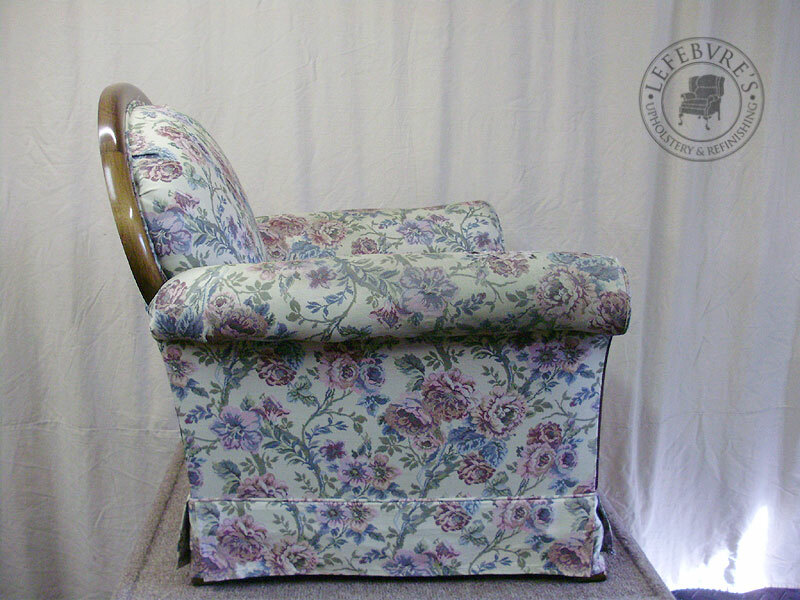 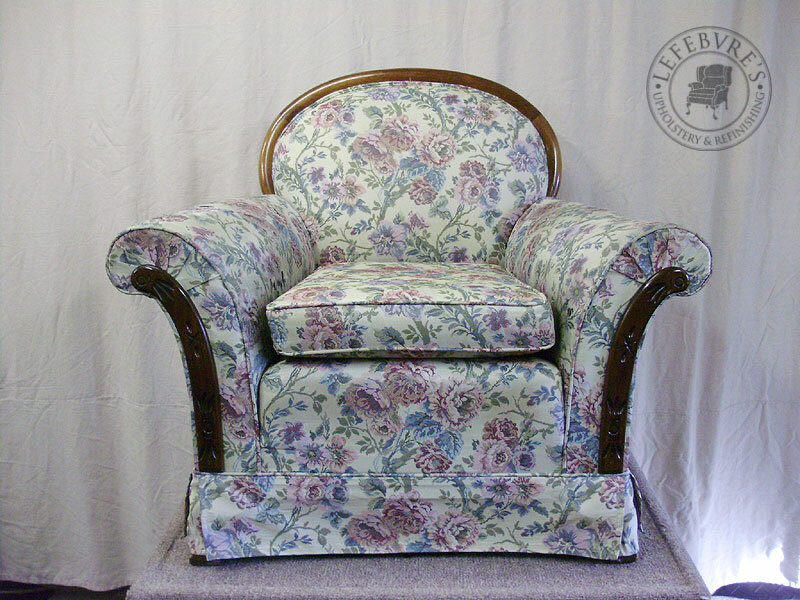 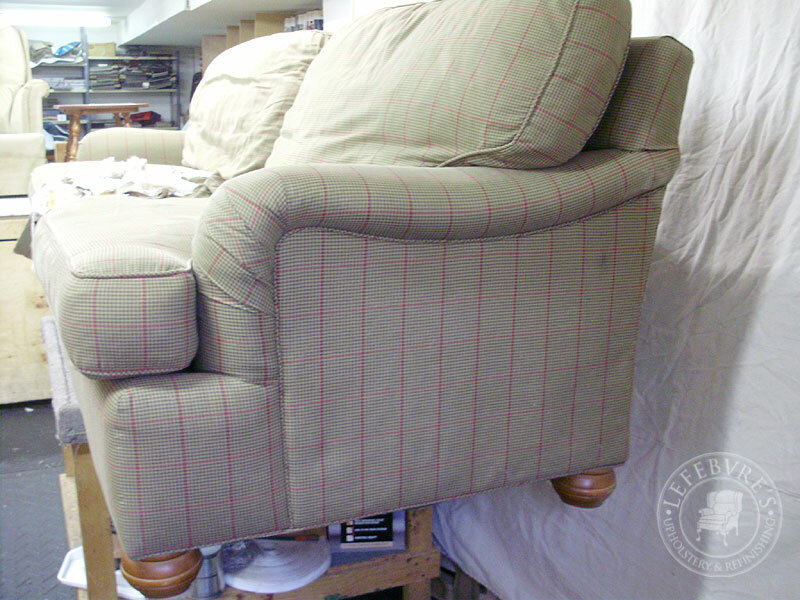 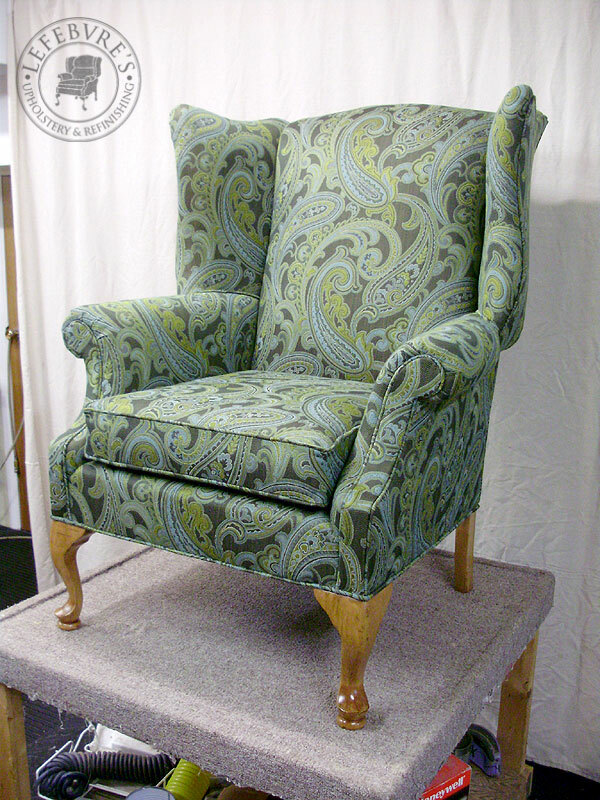 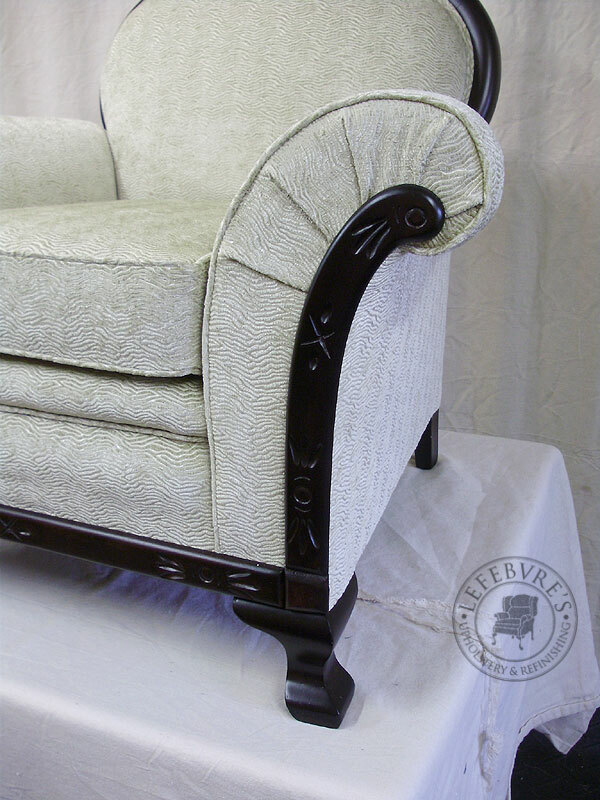 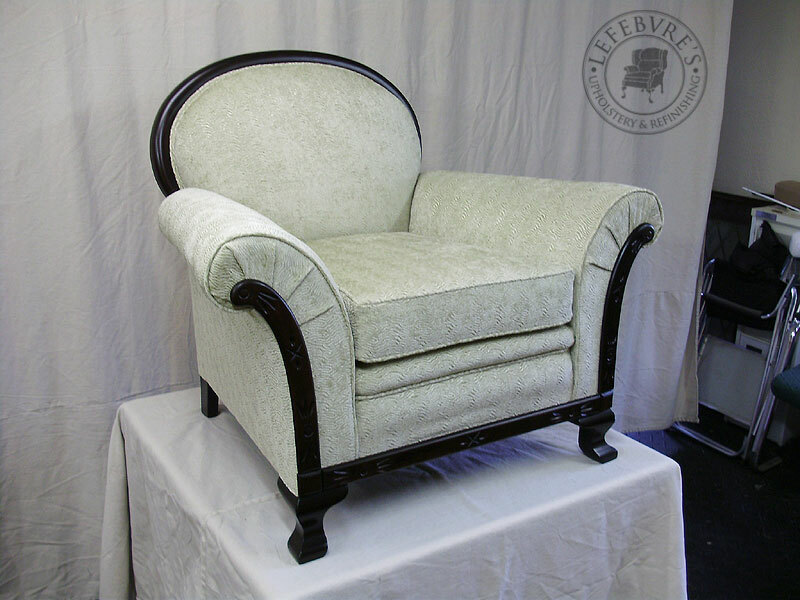 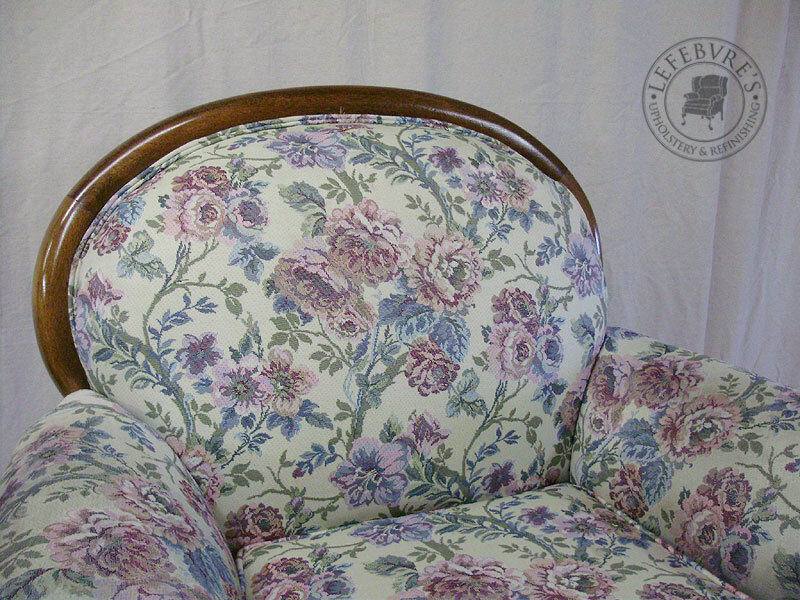 This is the sofa chair that matches the previous sofa, and wing chair. 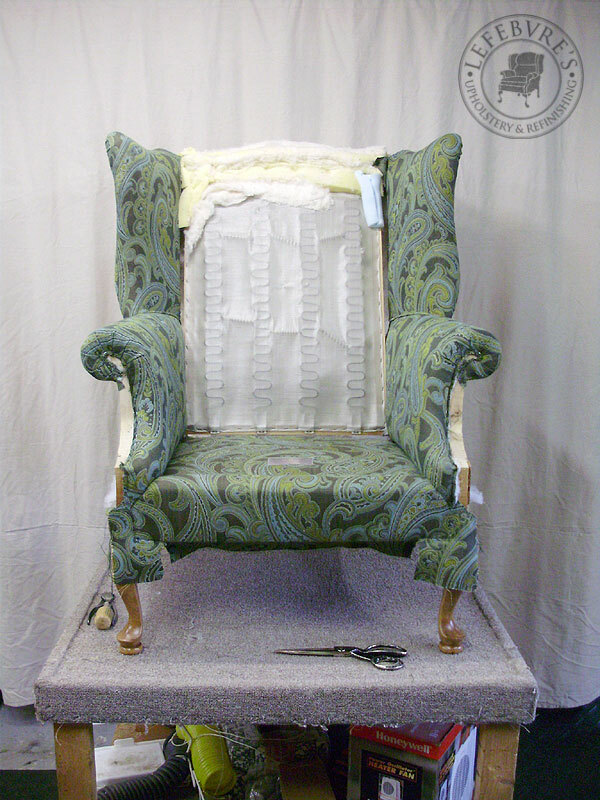 The set is likely from the 1920s or 30s. 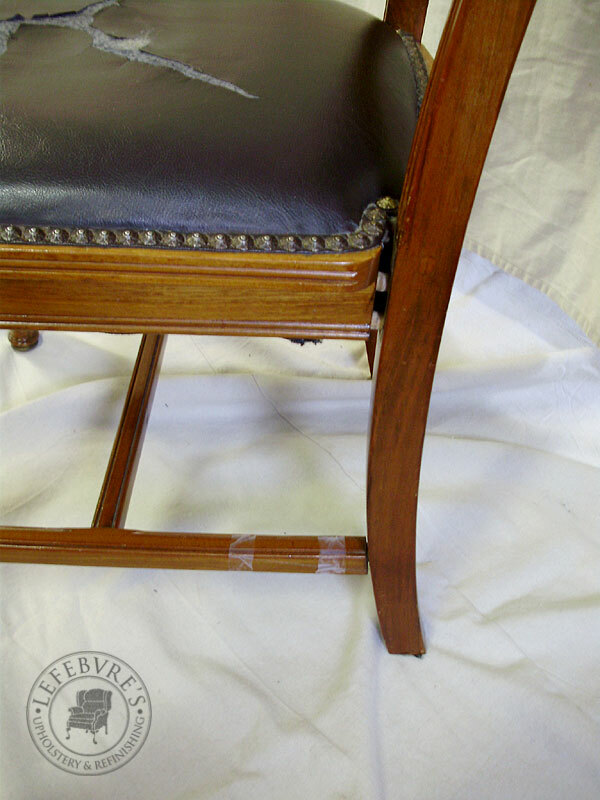 The chair was completely stripped down (see wing), refinished, repaired, and put back together. 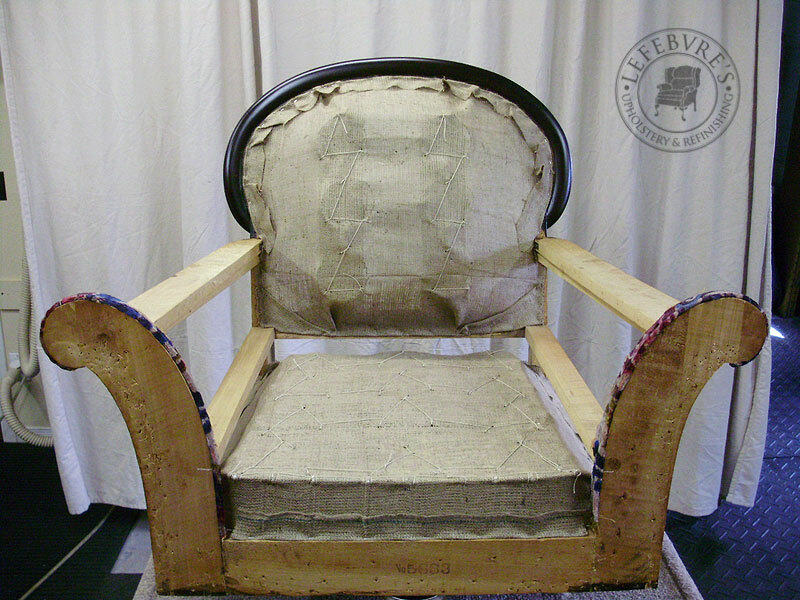 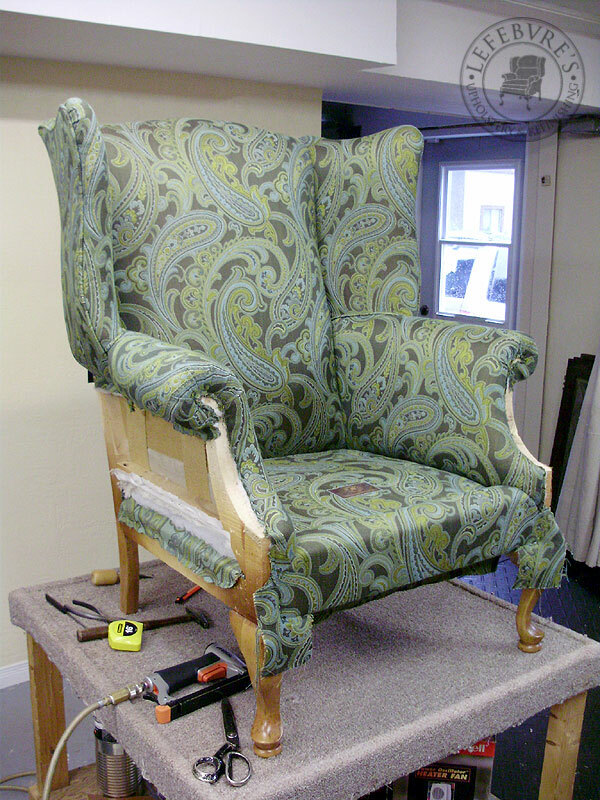 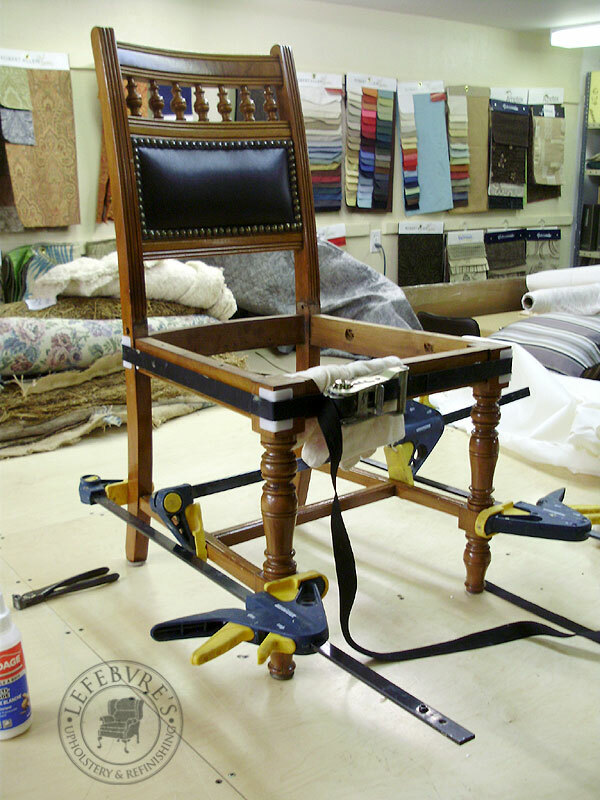 Here's the chair stripped down, refinished, and re-webbed. 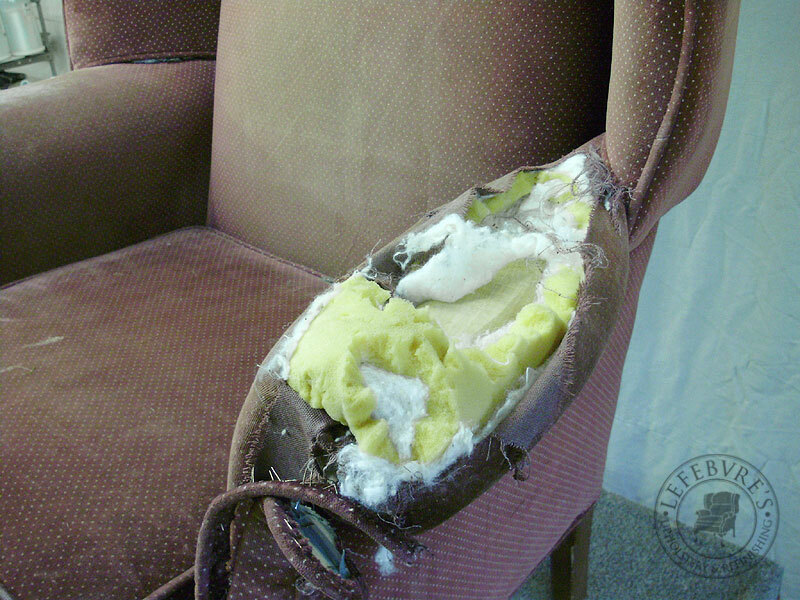 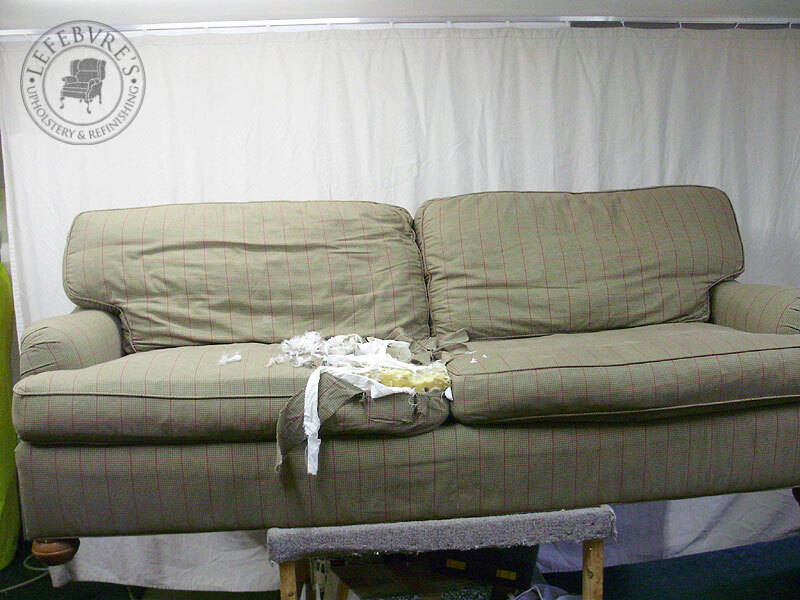 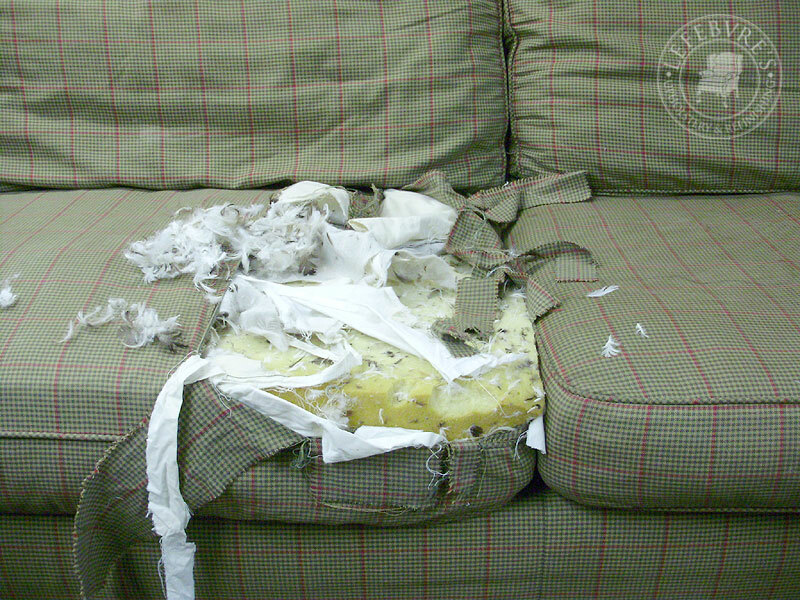 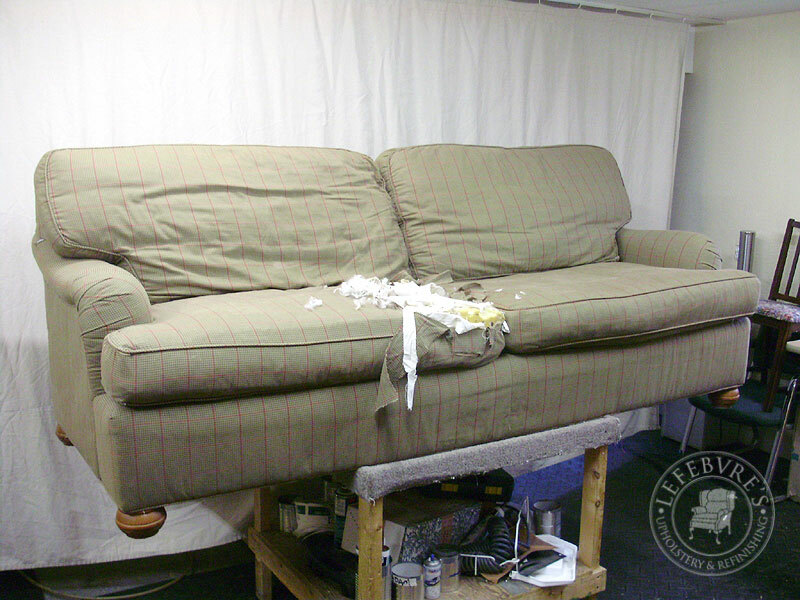 In the background, you can see the sofa frame being glued back together. 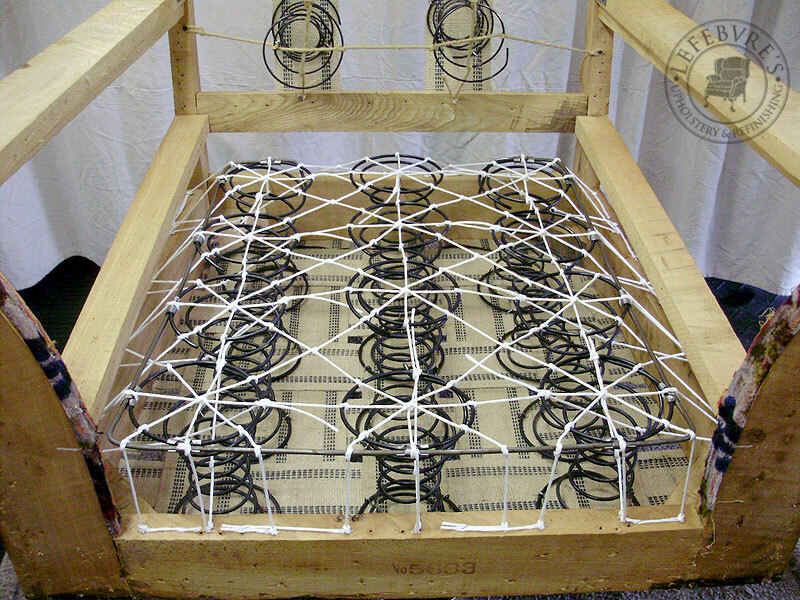 New webbing on the back springs. 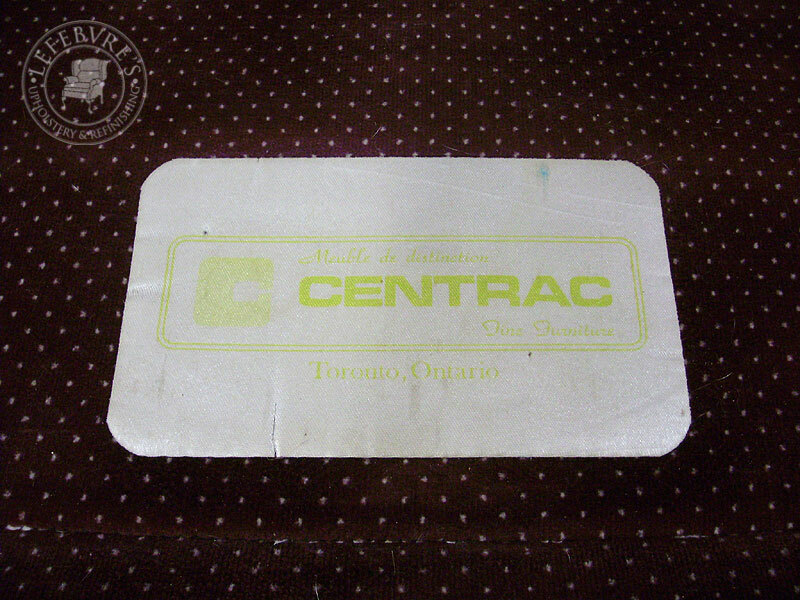 These ties were still in excellent shape. 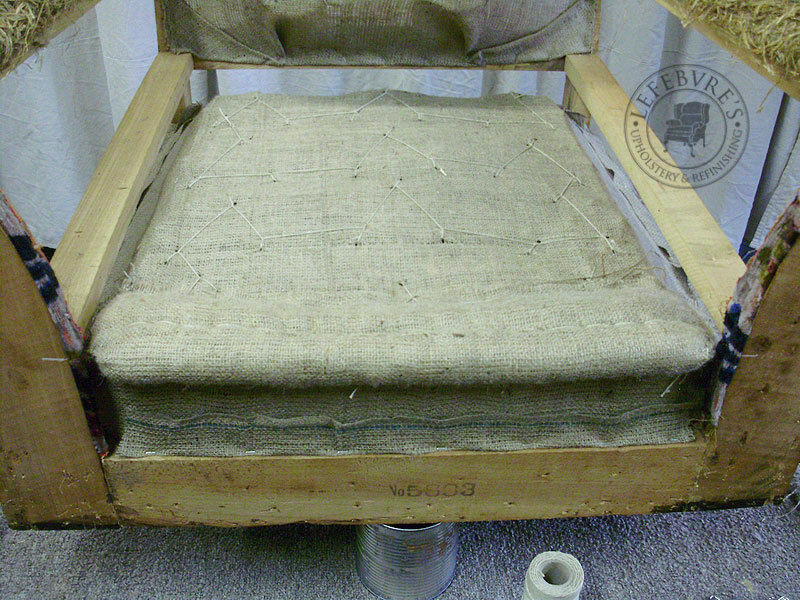 New burlap, with all the springs stitched. 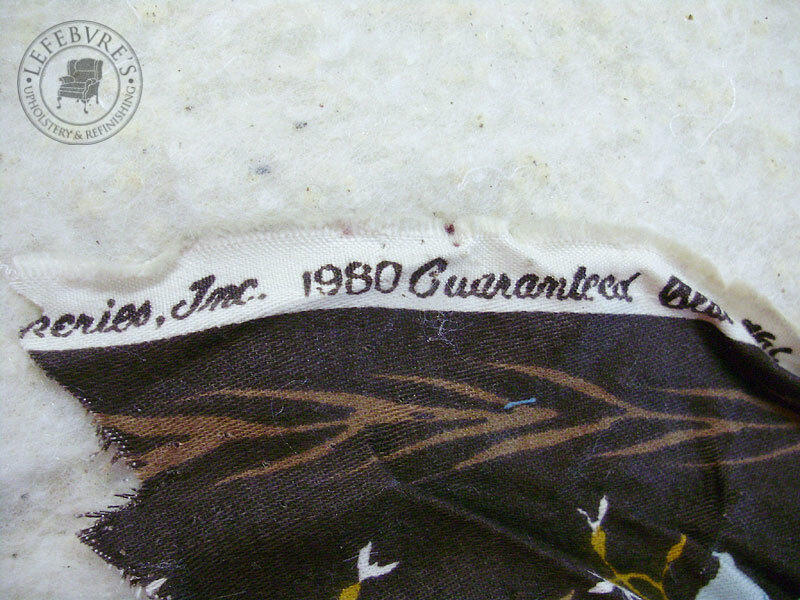 Here is a good photo that shows how the arms are stitched. 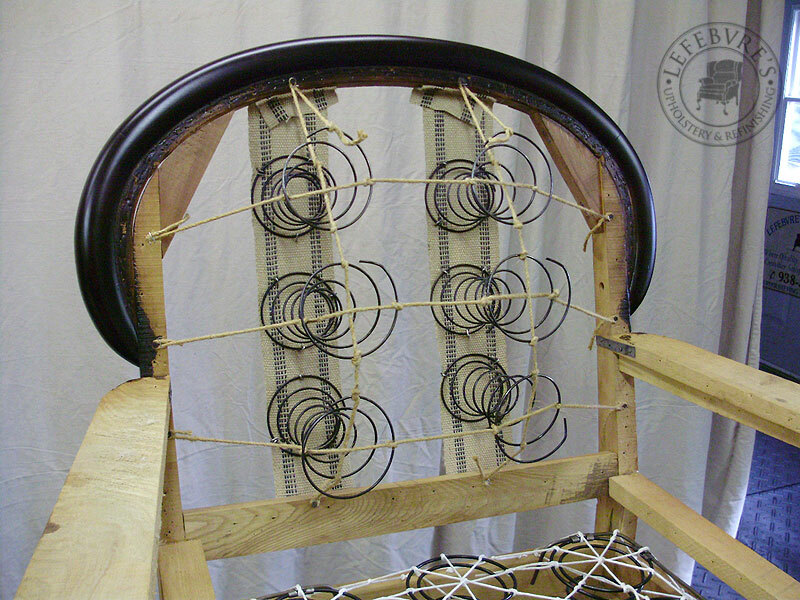 As previously shown, the flat wooden arm tops are made round with the use of compressed straw. 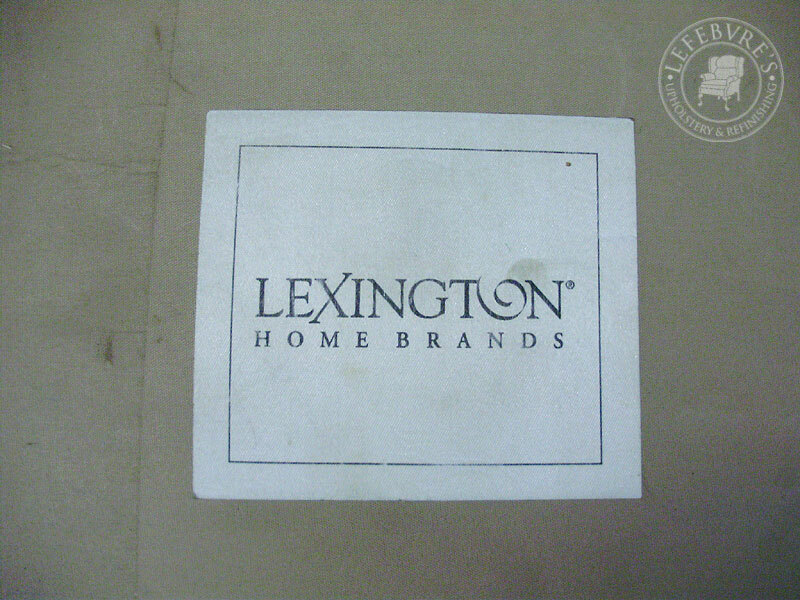 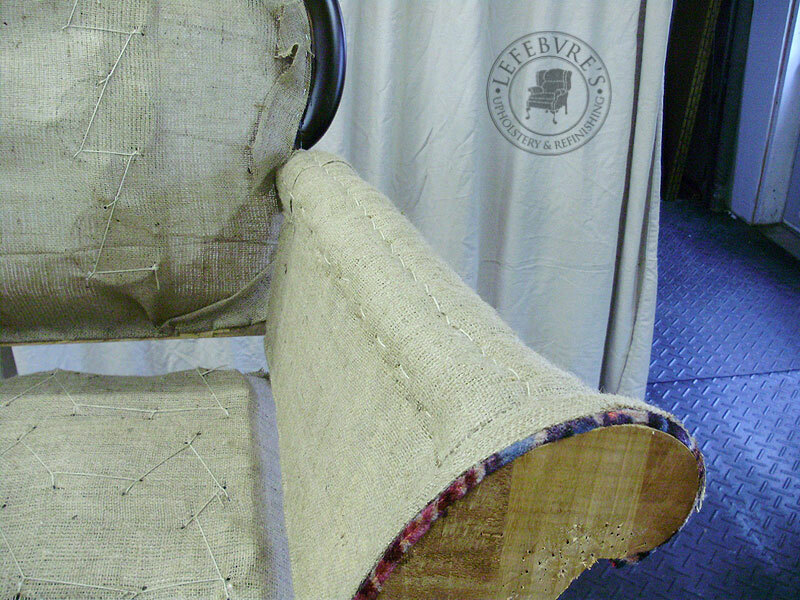 Over time, the burlap had gotten stretched and loose, and as a result, the arm couldn't maintain a nice shape. 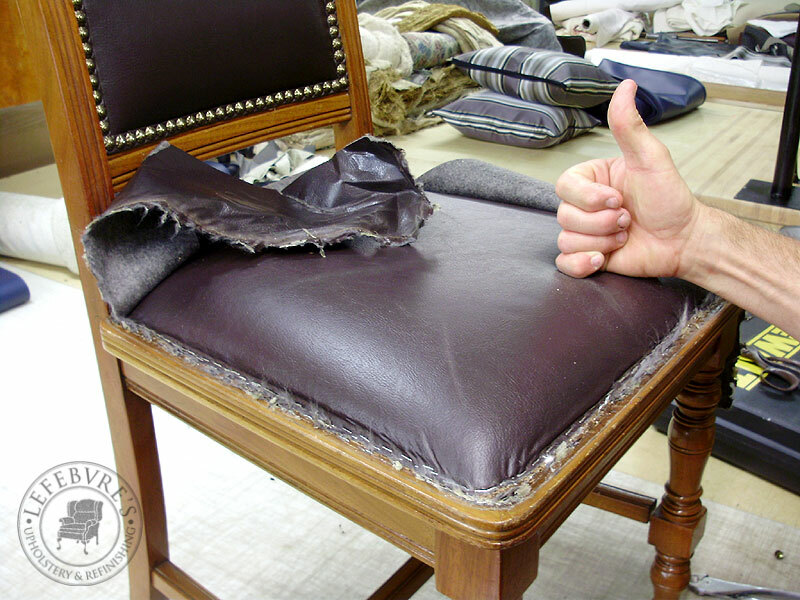 The arms were not originally stitched, but having them stitched this way will help keep the arms/stuffing in place longer. 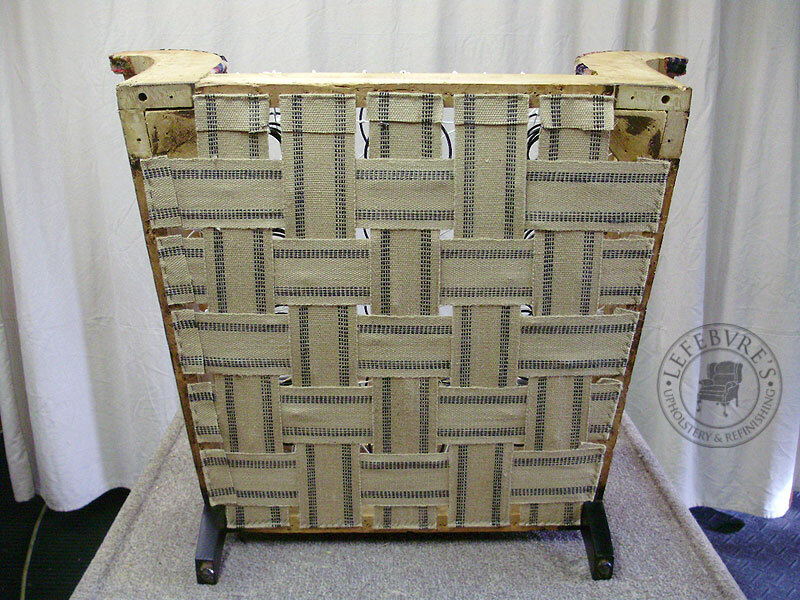 The straw is stitched in a triangular pattern (one row down the centre, and against the edge of the wood on either side). 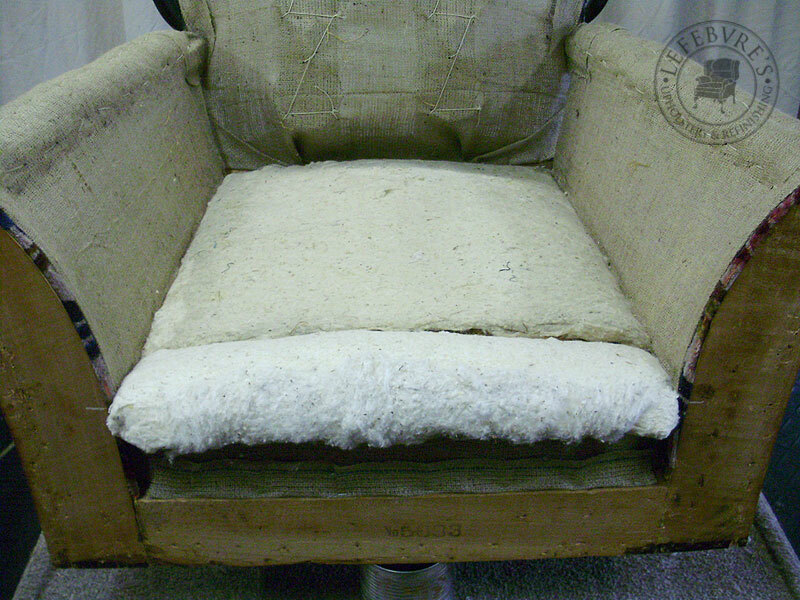 Seat/deck stuffing before rough covers (original straw and cotton, with the addition of new cotton as needed). 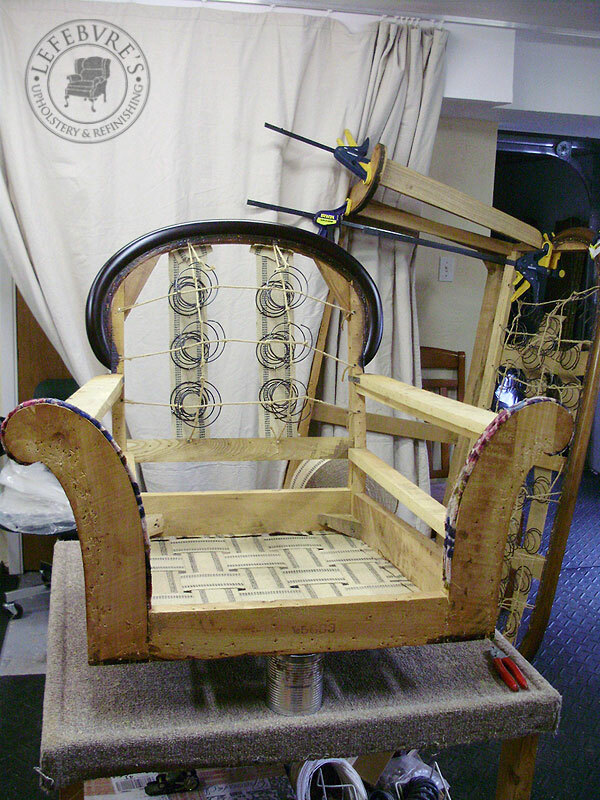 Deck completed, and back in progress. 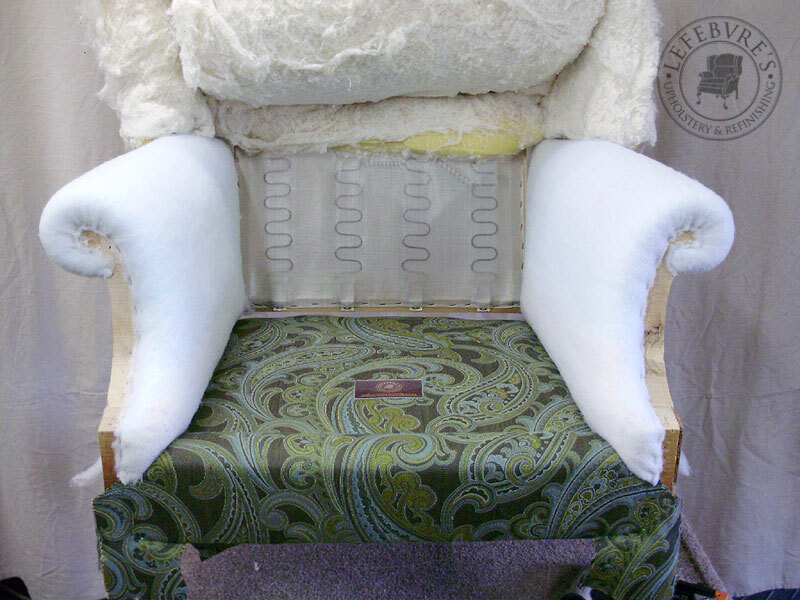 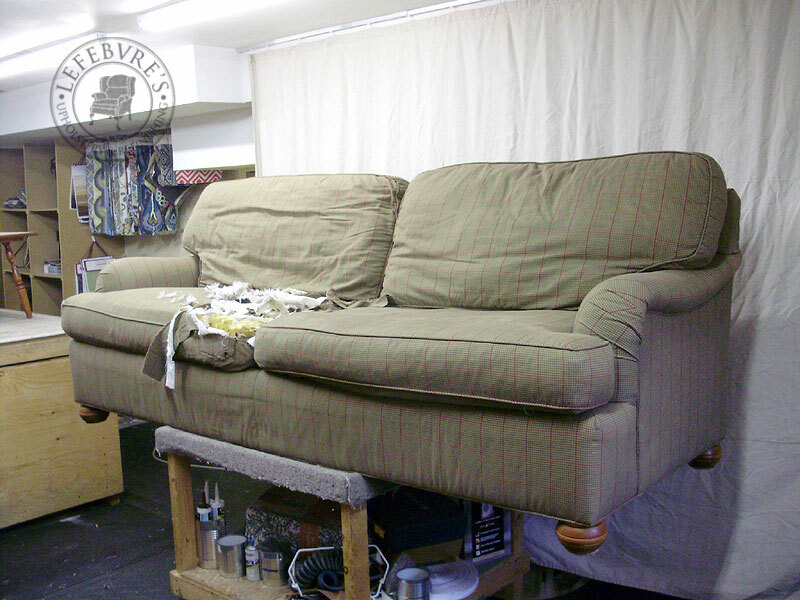 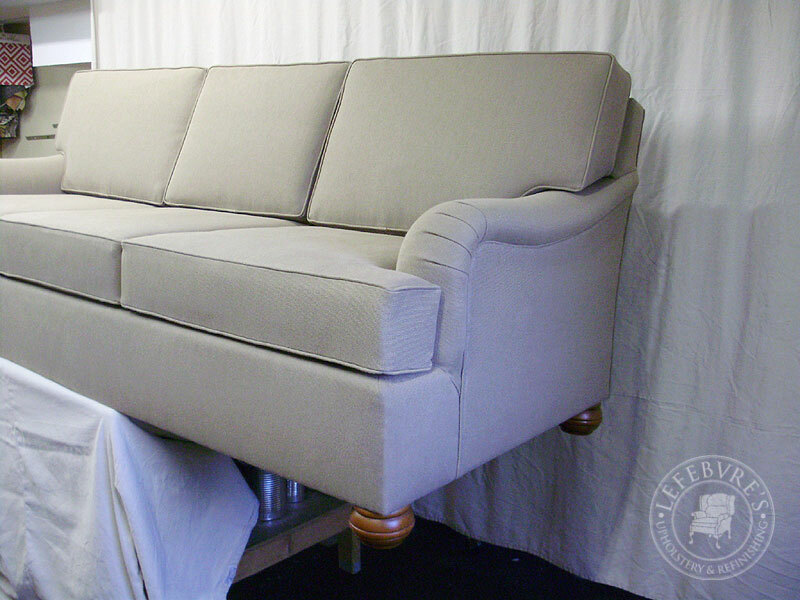 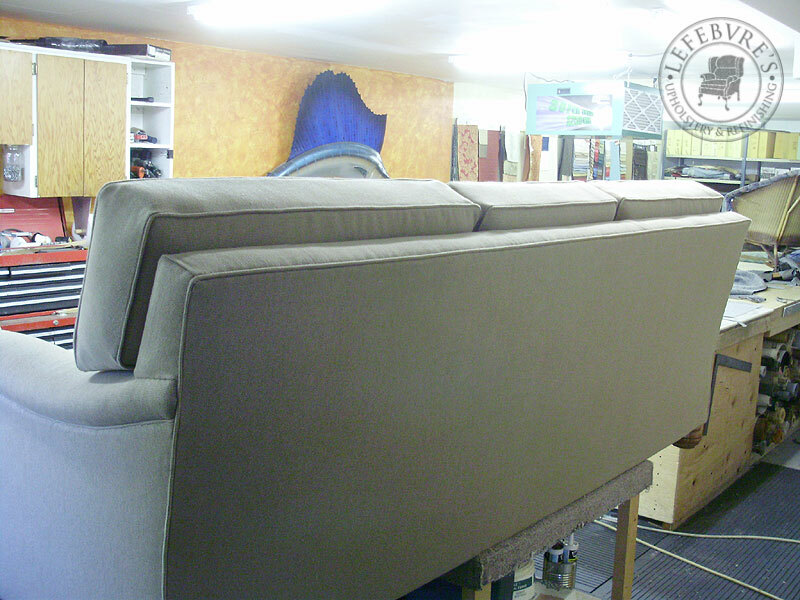 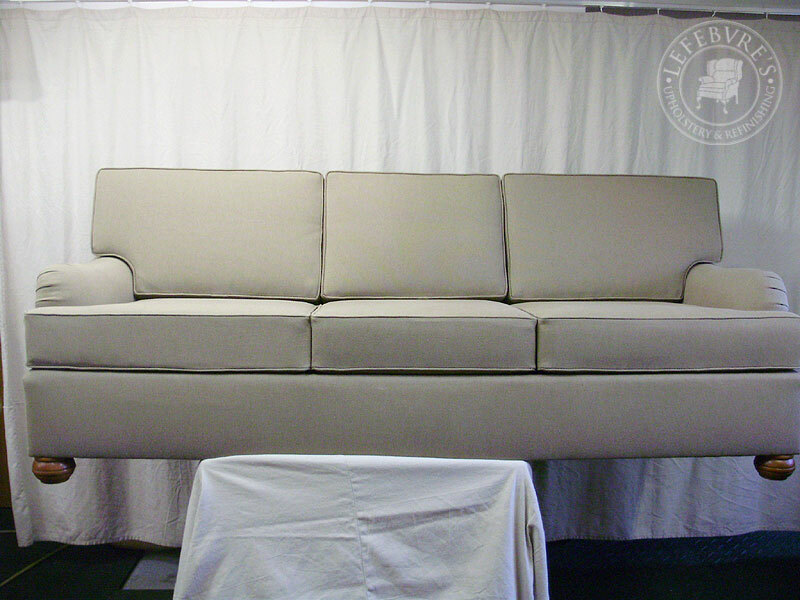 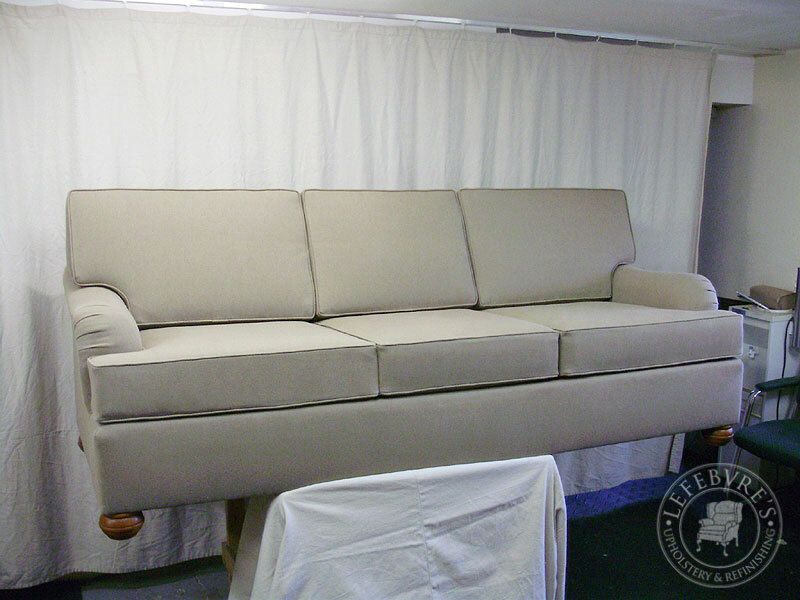 Because of the way the back/arms are attached, the back panel had to go in before the arms (the same for the sofa, but the opposite of the wing). 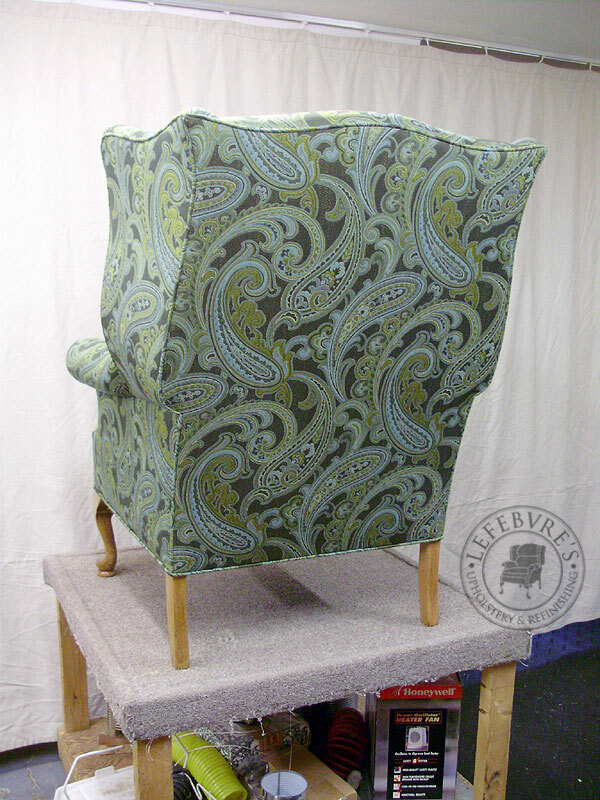 And here's the finished chair! 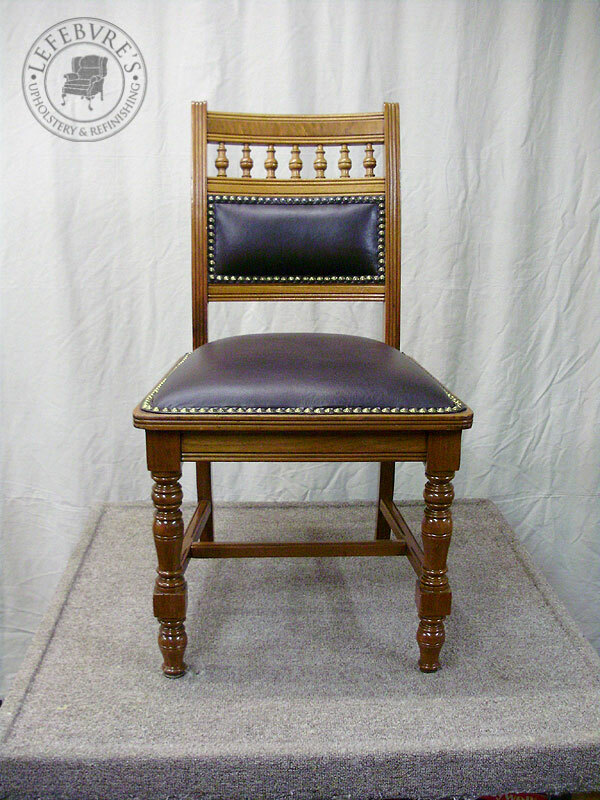 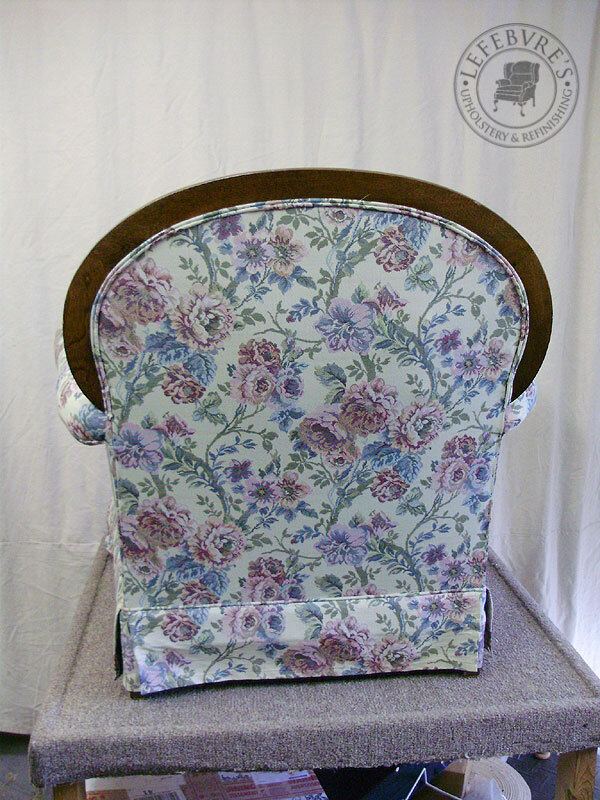 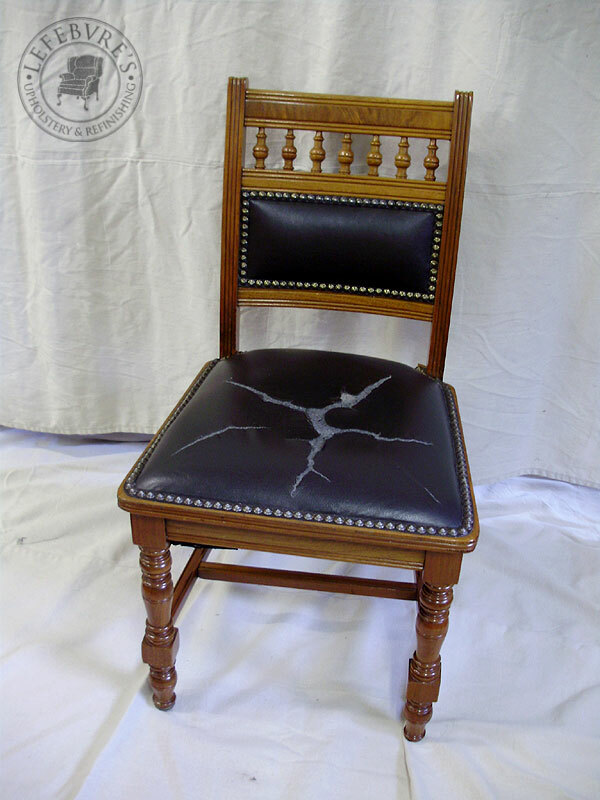 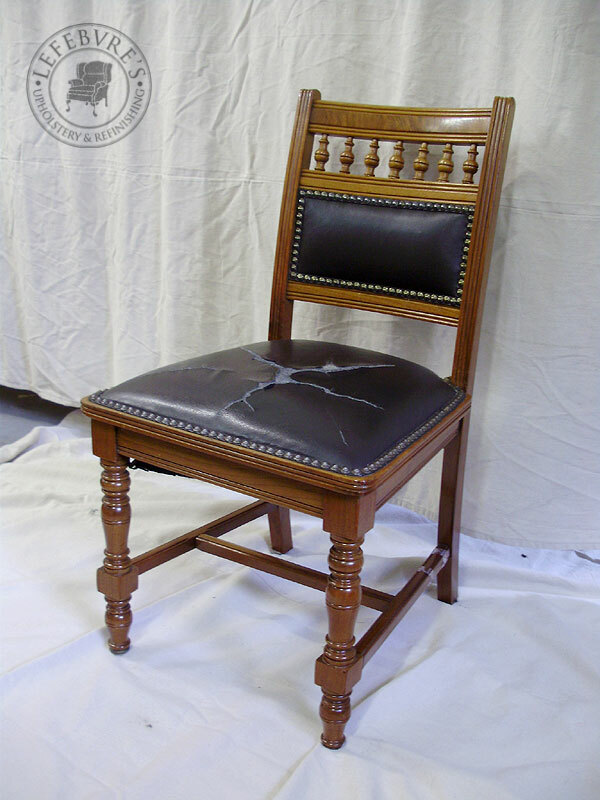 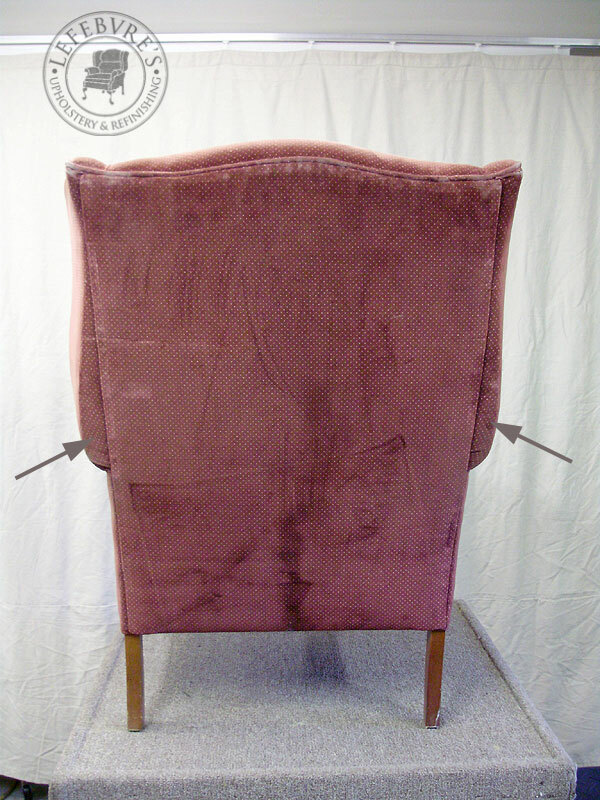 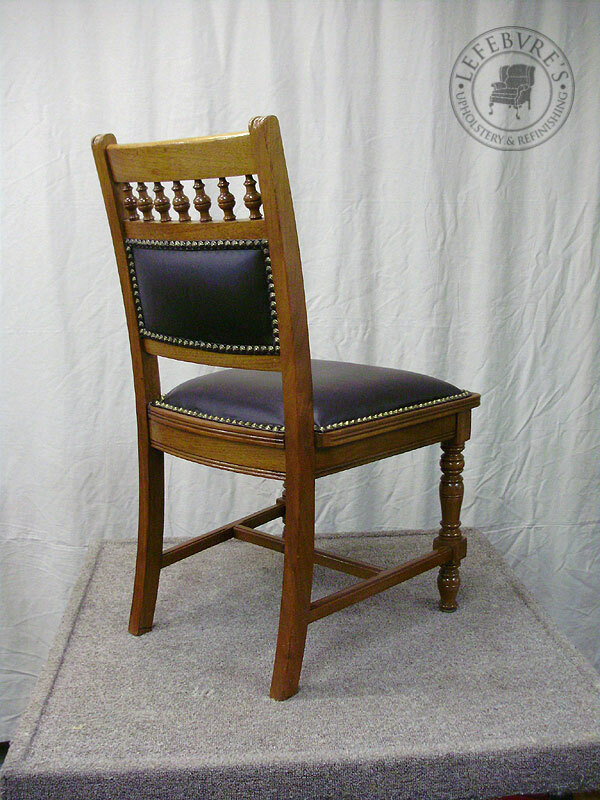 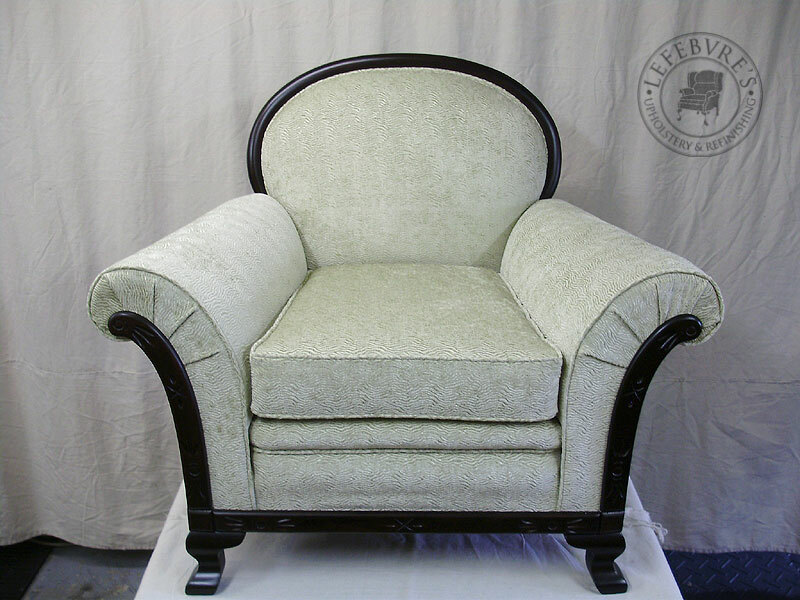 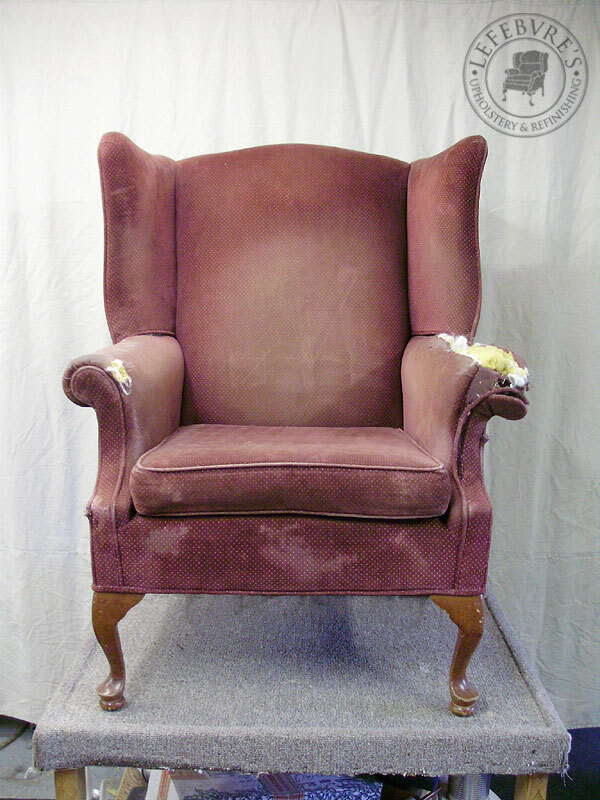 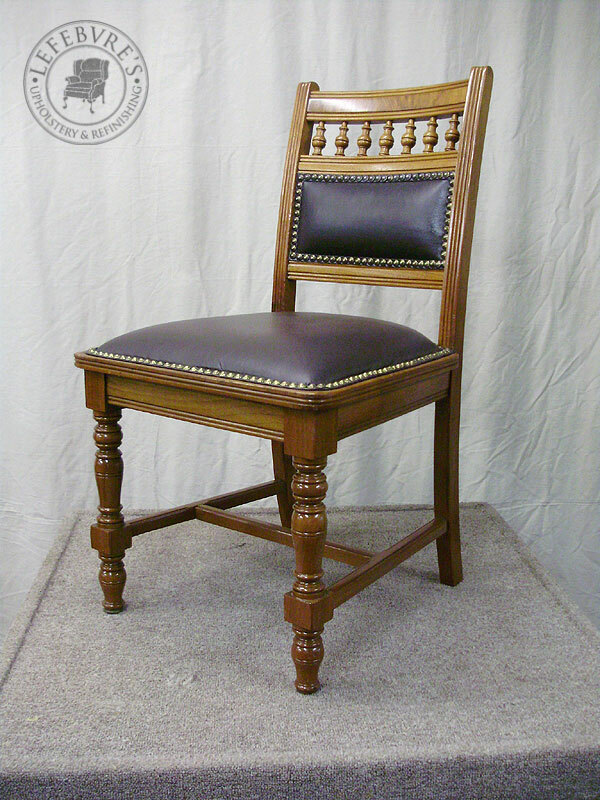 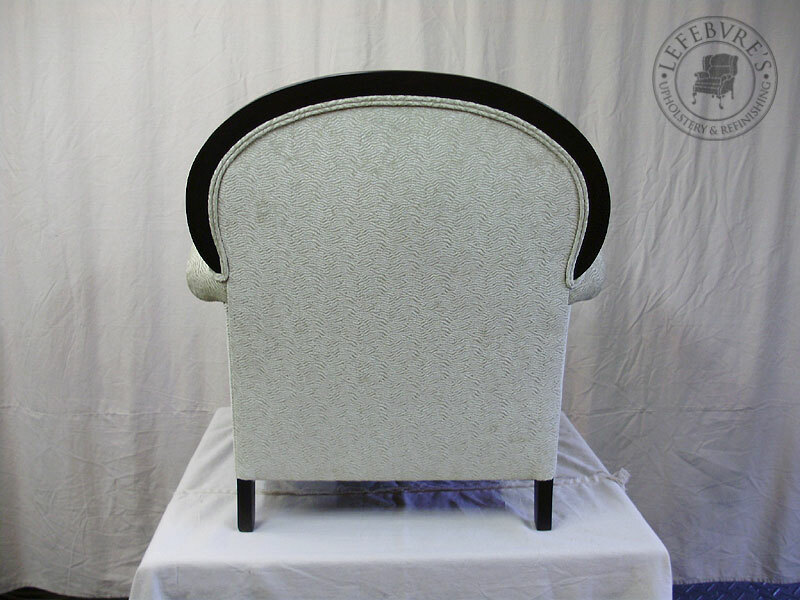 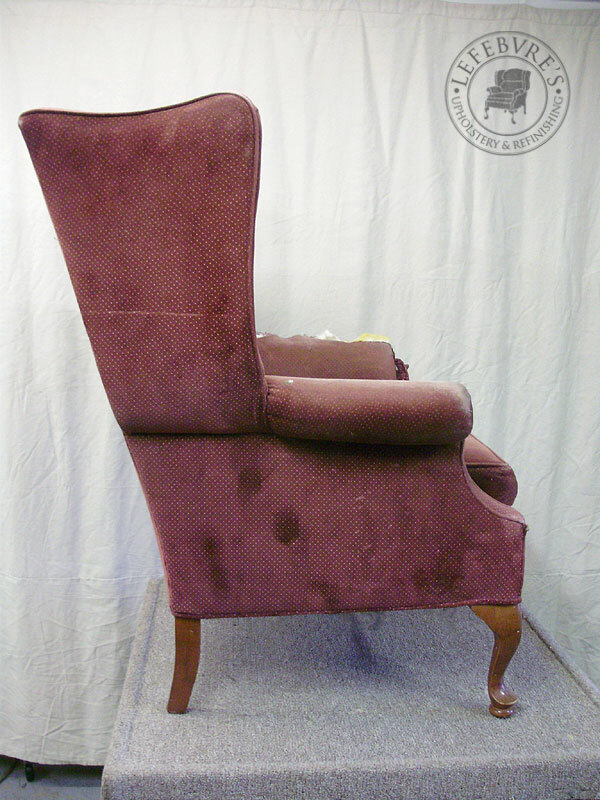 I love the back on this style of rounded-top chair.